1. Spritz a large frying pan with oil and cook the onion, lamb and peppers for 5 minutes until browned. 2. Stir in the tomato sauce, stock, lemon zest and juice and beans. Bring to the boil, cover and simmer for 15 minutes. 3. 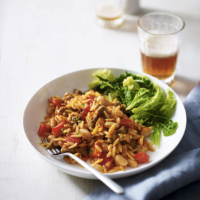 Stir in the orzo, re-cover and cook for a further 8–10 minutes until tender. Stir in the parsley and serve with a side of steamed cabbage. Try swapping the lamb for essential Waitrose British Chicken Breast Chunks or essential Waitrose British Turkey Skinless Diced Breast Fillet.